Set up: 15x30 yard area with a cone (defender) in the center of the area. Two lines of players (no more that 4 in each line) and every players has a ball. 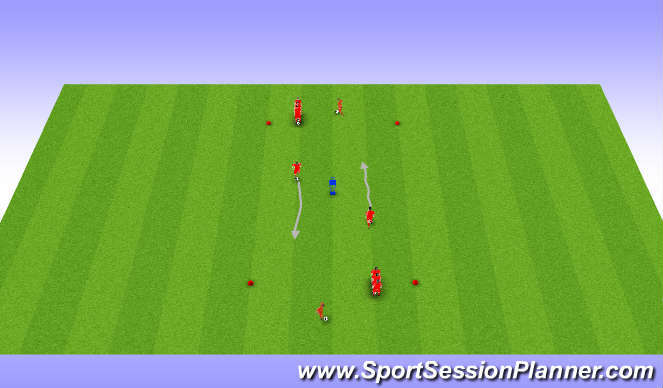 Exercise: The first 2 players in line attack the space with speed then join the opposite line. When the first player passes the defender the next person in line should set off. Ask the player to switch sides so they are able to practice dribbling with both feet. Set up: 15x30 yards with a cone (defender) in the center. Two lines of players opposite the Cone and every player has a ball. The players must dribble at the cone then complete a “killer” touch (right) to beat it. When the first player in line beats the defender the next player in line should go. •The Killer touch is a bigger touch to get in the space behind the defender then the player must change their speed to get past the defender. Ask the players to also to left so they can practice with both feet. Also use moves to beat the defender.